Here’s the latest snare drum to enter the collection. I have known about this drum for a few years. The previous owner is a very nice gentleman named Chuck Nusbaum. Chuck kept his word and gave me first choice on his drum. One of the last things we have is our word and I think that was very classy of Chuck to honor his word. Chuck told me that he found the drum in a small music store in Cleveland. We did the deal and here we are. 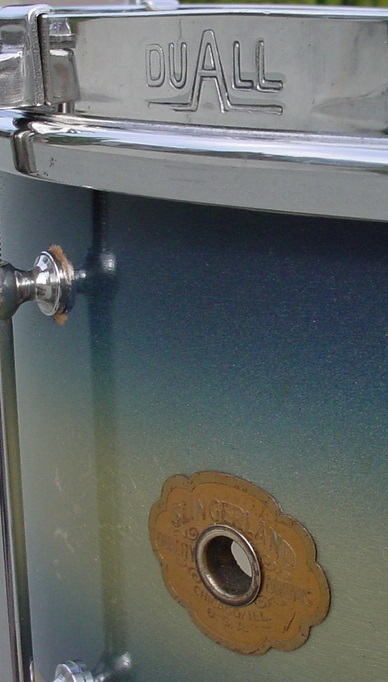 Slingerland DuAll models are extremely rare, especially the 6.5 x 14 models. A very brief history for those that may not know the history of the Ludwig Super vs. Slingerland DuAll battle: Ludwig & Ludwig had the patent (1924) for their parallel (Super-Ludwig) mechanism. 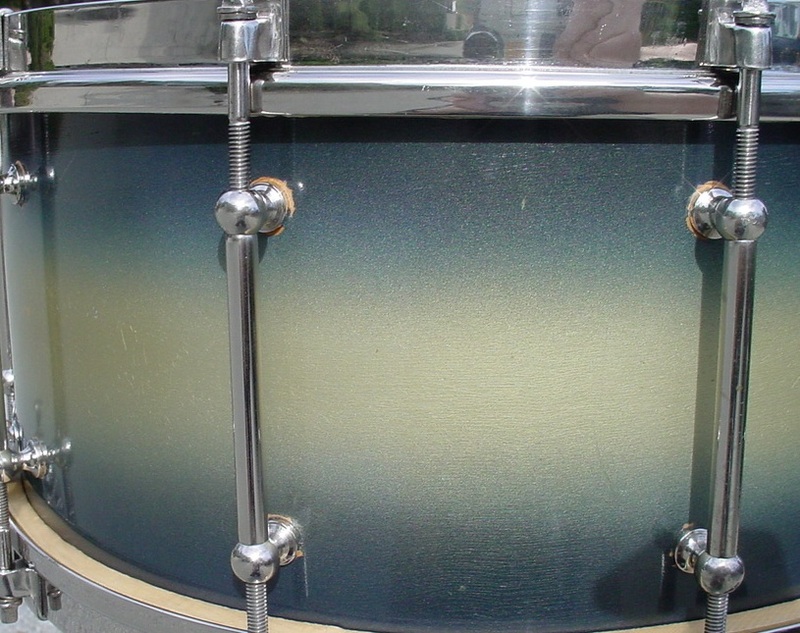 Along comes Slingerland with their version of a parallel mechanism that they called the DuAll model. Ludwig felt that Slingerland’s DuAll mechanism was infringing on their Super-Ludwig mechanism so they sued Slingerland and won. The court ordered Slingerland to discontinue their DuAll model and I seem to remember reading that Slingerland had to pay L & L the money that was made on their sales of the DuAll models. DuAlls were in production for less than two years so these snare drums are extremely rare. I am aware of probably 20 5 x 14 models and only 3-4 6.5 x 14 models. More on this in The Hardware section of my article. The solid maple shell is in great shape as can be seen in the interior photos. The Duco finish is in very good shape but still shows its age. All that was needed was a light cleaning/dusting. Granted the Duco finish is not as sought after or as popular as the pearl finishes but I do believe that the overall rarity of these drums is more important than the finish. The cloud badge is clean with a tight grommet. All of the nickel hardware is original and cleaned/polished up nicely. I own snare drums with three different interior versions of the DuAll mechanism: 1. A center post very similar to if not a direct copy of the Super-Ludwig center post. 2. An interior “pulley” type mechanism instead of a center post. 3. No center post and no “pulley” mechanism. This version of the interior attaching hardware seems to have been factory sealed at both ends where a center post would have originally been. I have included photos of all three examples. My theory is that version #1 was the original DuAll mechanism that triggered the patent lawsuit. Version #2 was a “work-around” that was tried after the court decision. Version #3 was the last attempt before the DuAll model was discontinued. The drum in this article has version #3. This drum does not have a Tone Flange as is the case with my other two “pulley” mechanism DuAlls. My observations of the three versions of the DuAll mechanism show that only the “first” version (center post) came with Tone Flanges while versions “two and three” were not equipped with Tone Flanges. 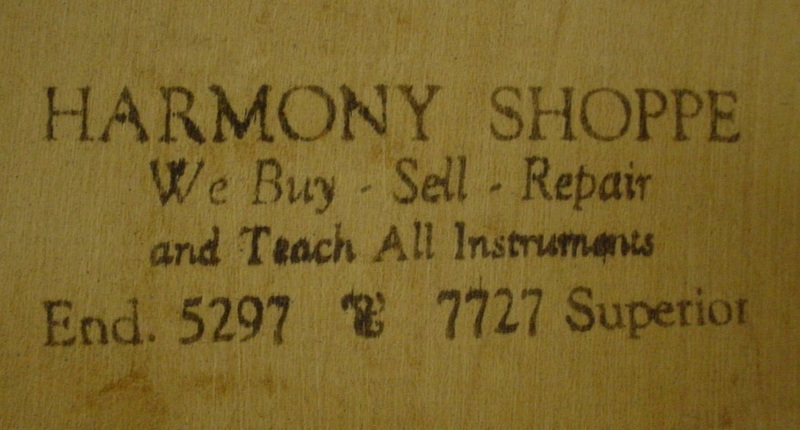 The manufacturer’s cartouche markings on the snare gates are “A” and “AA”. Original calf heads from The Harmony Shoppe and original snares rounded out this cleaning/restoration. I always welcome your feedback, added information and comments so feel free to weigh-in on this drum or any similar drum that you may have or know of.